Here, the team behind the wildly popular Blue Marble Ice Cream shares their valuable life lessons. F&W's #FOODWINEWOMEN series spotlights top women in food and drink in collaboration with Toklas Society. Follow the hashtag on Twitter (@foodandwine). Here, the team behind the wildly popular Blue Marble Ice Cream shares their valuable life lessons. The name Blue Marble was borrowed from the playful moniker for planet Earth and represents our dream of a more delicious, just and joyful world. Every day, we work to bring this dream to life. We began as a small Brooklyn brick-and-mortar in 2007 and have grown into a nationally recognized brand with scoop shops, seasonal outposts and a robust wholesale division that supplies clients across New York City, including Barclays Center, Fresh Direct, Bareburger, Tavern on the Green and jetBlue. Blue Marble is NYC’s first and only certified organic ice cream company. This important distinction signifies our unwavering commitment to responsible agriculture, fair compensation for farmers and good, honest food. With the launch of our nonprofit venture, we dreamed even bigger. Blue Marble Dreams’s mission is to create jobs, joy and prosperity through…ice cream. In 2010, we mobilized the resources of our community to help a group of Rwandan women launch an ice cream shop of their own. Inzozi Nziza (Sweet Dreams) employs local women, supports farmers and provides a place for people to gather and revive. Next up is Sweet Dreams No. 2: Bel Rev in Port-au-Prince, Haiti. This special shop will be built in proud partnership with Haiti 155 and with tremendous support from NRG, which will supply repurposed shipping containers outfitted with state-of-the-art solar panel systems, enabling our energy independence. Our staff are all survivors of sexual violence—women who have endured unthinkable trauma yet are determined to build safe, self-reliant and happy lives. 1. Say YES. 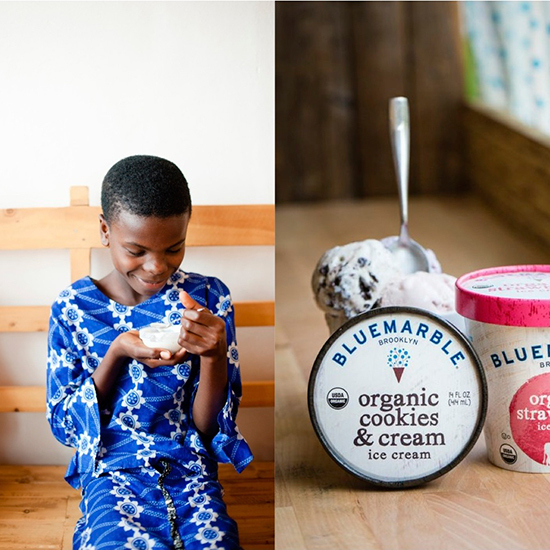 Blue Marble hadn’t yet celebrated its first birthday when we were approached by the Rwandan women and asked to help them build an ice cream business of their own. The reasons to decline were numerous, but we were unreasonably compelled to say yes—and boy, are we glad we did. We’ve continued to say yes as frequently and boldly as we can, and our business—and lives—have grown and flourished as a result. 2. Treat your integrity as your most valuable asset. Soon after launching Blue Marble, we realized why so few other ice cream brands—food brands in general, actually—chose to become certified organic. The certification is hard to get, even harder to maintain and requires a different, more holistic and more patient perspective on one’s bottom line. Because we have gone the distance when so many others have fallen short, though, we have outpaced the competition in many ways and been rewarded with innumerable, invaluable opportunities that have fueled our success. 3. Invest in the happiness of others. On Inzozi Nziza’s opening day, we watched the expressions of elderly Rwandan women transition from bemused shock to unabashed ecstasy as their first-ever bite of ice cream settled on their tongues. All of the hardship momentarily melted away from their minds, and they were fully present in that joyful, dreamy moment. What we witnessed in that experience was the power of happiness. It transports us from the hardship within and around our lives and allows us to indulge in the possibilities ahead. And this is how a better world begins.